Application delivery uses mobile detection to deliver the correct version of an app to the right device. 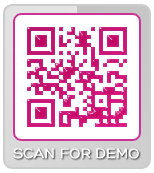 Application delivery can be triggered from a 2D barcode or from a link in a mobile landing page. Both options are direct to content. Our application delivery reaches thousands of the most popular handheld devices, including iPad®. Inbound / outbound tracking. Full analytics are available. Scan the code to access the SiriusXM® App for your device. The SirisXM App is available for Android®, Blackberry® and iPhone®.